Do Tiki Torches Need Special Oil? Tiki torches are an excellent way to light an outdoor gathering. They come in two forms: gas and oil. They come in different materials, such as metal and bamboo or cane. They can be small, and meant for table-top display, or they can be atop a shaft that is meant to be placed in the ground. The "Tiki" tradition of decoration, started in the 1930s, was inspired by Polynesian culture, and gained peak popularity in the mid 20th century. Tiki torches can be lit with two types of oil. Many tiki torch retailers offer "tiki oil" for use with tiki torches. But you don't need to buy their "tiki oil," which suggests that the oil is special in some way. Apart from the two generic types of lamp oil used, there is no "special" tiki torch oil. 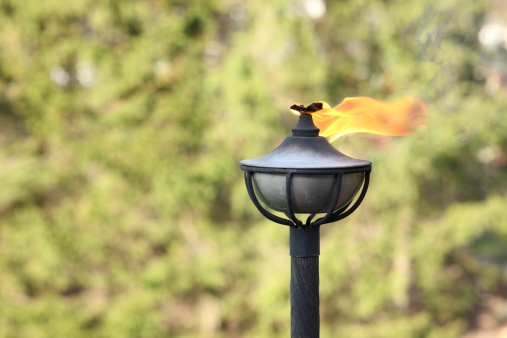 Tiki torches can be fueled with paraffin oil (also known as kerosene), citronella oil, or a combination of both. Kerosene, or paraffin, oil is ideal for tiki torch use because of its long burn time and minimal scent. Citronella oil is scented specifically to deter the accumulation of bugs (mosquitoes) around the tiki flame, which can become a nuisance to people using the light of the torch. The easiest way to acquire oil for your tiki torch is to purchase paraffin lamp oil. Price is based on quantity sold. You can purchase such oil at hardware stores, home improvement stores, and some sporting goods stores. Cabela's, Amazon and Ace Hardware are common retailers of paraffin lamp oil. Marisa Swanson began writing and editing professionally in 2007. How Do Tiki Torches Work? What Kind of Oil Do Electric Chain Saws Use?